Year's End Newsletter... Here's to 2017! It is almost Christmas time and my how this year has flown by. I am very grateful for all the blessings the Lord has provided for me personally my first year as Executive Director and for all he has done for EPIC! He never ceases to amaze me of His love and tender mercy. The goal of our organization it to reach the women who experience an unexpected pregnancy with the love and compassion Christ extends to each of us. We have been able to serve 1409 clients in our centers, and we have preformed 113 pregnancy tests through November with your help! Many of these ladies attend prenatal and parenting classes and earn those baby bucks to “buy” things from our baby boutique. 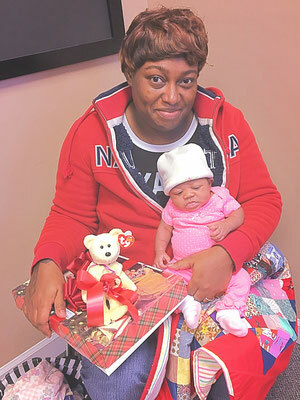 We are blessed to have needed items for their babies and make things a little easier for them as they “learn to earn." It’s time to think about year end giving! We would love to be on the top of your giving list this year. You can help us in a big way to start 2018 overflowing with goods and the funds to sustain us through another great year. Please spend some time in prayer over what God would have you give to EPIC this year and then send in a check or go to our website easternpregnancy.net for safe online giving. Remember to get tax credit in 2017, it must be postmarked by December 31st. Merry Christmas from all of us at EPIC! May God richly bless you though this holiday season and have a joyous New Year! A lady from First Baptist Church brought us water and snacks for our classes and received a tour. We explained how clients earn the items in our Baby Boutique by coming to class. 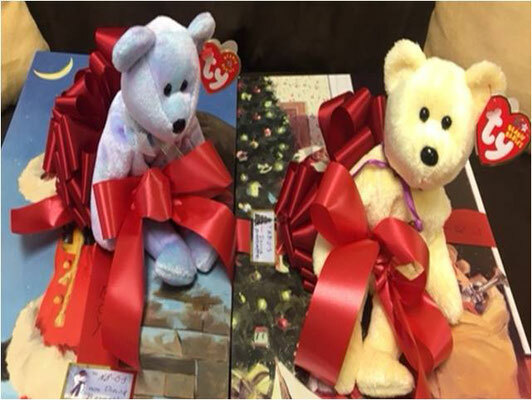 She was so inspired that they earned these items, she bought 2 brand new baby outfits, wrapped them in Christmas paper and topped them with a TY® Beanie baby. I started volunteering at EPIC summer of 2015. It was one of the many joys of my life. Getting to know our clients and serving alongside the staff and other volunteers was SUCH a treat for me. This is a spot where the Lord shines bright, and that’s very attractive—and contagious! Next thing you know, I get the opportunity to join the very staff I’ve come to enjoy working with. And right at a time of need. EPIC was in the throes of a shift in leadership and I was working at another non-profit in Greenville where we were dealing with the very same thing. Just as that position ended this one began! God is good. I love our clients, my co-laborers in this mission, and the good work we get to do. We are on the front lines of saving lives here, so please keep us in your prayers. This time of the year commercial advertisements would have us think that all should be joyful, happy and exciting if only we had… If only this were true! My heart breaks to see God’s creation, hurting. Hurt, no matter if spiritual, physical, mental, emotional, financial, or social will come into our lives in one form or another. It could be poor choices we have made, things others have done to us, or situations that just happen. We can sit around moaning, wishing things were different or use that ‘hurt’ to help others. God gives us that choice. 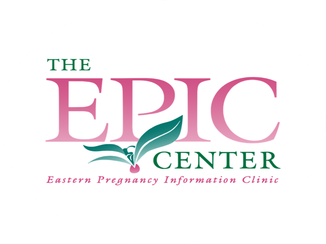 EPIC to me is a healing center. Even though my hurt is different than the men and women who come to our centers, hurt is hurt. I thank God for my family, Christian friends and EPIC who helped me heal. The staff at EPIC have a genuine, sincere heart for their clients. Witnessing how they reach out to them has helped me tremendously. Little did they or I know how God would use them to help me in my healing journey. Even though we may not understand the hurt, trust God and may He bless you.